An evening pause: The video replays her singing the same thing three times. There is a good reason, as she almost appears to have begun singing as a lark, and the acoustics of the church astonish her. The repeats help bring out this amazing quality. One day after India completed an air strike in Pakistan on what it called a “militant group” responsible for a suicide bombing that killed more than 40 Indian soldiers earlier in February, Pakistan now claims it has shot down two Indian jets near the border between the two countries. The escalation, many fear, has increased the risk of a full-fledged military confrontation between the two nuclear-armed countries. The biggest worry for the international community at the moment is that this could lead to a nuclear confrontation. Although, both countries have played down the risk of a nuclear war, regional and international players remain watchful. The possibility of nuclear war? No big deal, and far less important than watching and being absorbed by Congressional testimony of a convicted liar whose life, no matter how odious, has been destroyed not because of anything he actually did but because he simply happened to be the lawyer for Donald Trump. The uncertainty of science: An analysis of data from New Horizons now suggests a paucity of small objects in the Kuiper Belt. I therefore wonder how the objects we do find there formed. The volume of space in the Kuiper Belt is gigantic, and if the larger bodies found so far are the bulk of the objects there, what did they coalesce from? Moreover, it seems unlikely that the few large objects we have found there would have been able to clear the region out of small objects. Overall, this is a fundamental mystery tied directly to how the solar system formed, and illustrates how little we know about that process. The engineering team that will drive ExoMars 2020 on the surface of Mars in 2021 has completed a test drive using an engineering prototype, controlling it from more than 6,000 miles away. Experts at the European Space Agency’s centre in Oxfordshire completed a series of tests across nearly 6,900 miles (11,000 km) in order to see how the Mars rover reacts to commands across large distances. I must admit that every press release from Europe about ExoMars 2020 gives me worried chills. Each release is often filled too much with empty boasts and little substantive detail. Worse, each seems to repeatedly remind me of some guy working in his garage on a weekend project. The issue could merely be a case of poor press release writing, but something about each release makes these alarm bells go off in the back of my mind. With the launch only about sixteen months away, I hope I am wrong. An evening pause: Unfortunately the youtube link does not say when this happened, but based on one Borge joke I suspect it was during the Eisenhower administration. If alien megastructures exist at Tabby’s Star, new research has precluded the likelihood that those aliens are using lasers for communications within those gigantic structures. [The scientists checked] for laser signatures, on the not unreasonable grounds that any structure large enough to encase a star – Boyajian [Tabby’s Star] is almost one-and-a-half times the mass of the sun – would have an internal communication system, for which lasers would represent a good candidate medium. In the latest research, Lipman and colleagues decided to test the idea. They analysed 177 high-resolution spectra from the star, gathered by the Lick Observatory’s Automated Planet Finder telescope as part of the Breakthrough Listen Project. They estimated that the data was so detailed that lasers with power greater than 24 megawatts should show up. To hunt for them, the researchers developed an algorithm to perform a pixel-by-pixel analysis of each spectrum in order to identify “spatially unresolved emission lines that meet the criteria for an artificial laser signal”. The good news is that they found several. 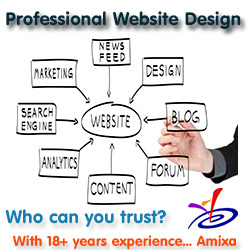 The bad news is that a secondary multi-step analysis designed to pick up false positives discounted them all. “The top candidates from the analysis can all be explained as either cosmic ray hits, stellar emission lines or atmospheric air glow emission lines,” they conclude. We must remember that alien megastructures are the most unlikely explanation for the random light fluctuations of Tabby’s Star. This research helps to strengthen that conclusion. It appears that the second engine burn to raise the orbit of Israel’s privately built lunar lander, Beresheet, did not happen as planned because of an unexpected computer reboot. The question that immediately comes to mind: Did they purchase a space-hardened computer? Cosmic rays can wreck havoc on computer memory, causing just this type of unexpected reset, so computers in space need to be much better shielded than on Earth. Capitalism in space: The privately-funded Israeli Beresheet lunar lander has successfully completed its first orbital maneuver. The 30-second engine burn raised its orbit’s low point by 600 kilometers. They will next do a series of similar maneuvers to steadily raise the orbit’s high point until it carries the spacecraft into the Moon’s sphere of gravitational influence. The actually landing is presently scheduled for April 11. SpaceIL was set up as a non-profit, with this its only planned mission. However, the subcontractors who built Beresheet’s lander and batteries are now looking into commercializing their capabilities. Israel Aerospace Industries, which built the lander, has shown an interest in commercializing the platform. In January it announced a partnership with German company OHB to make it available for potential future missions by the European Space Agency or other national space agencies. Around the time the Falcon 9 carrying Beresheet lifted off, Japanese company ispace also announced milestones in the development of its lunar lander systems. The company announced an agreement with Japanese firm NGK Spark Plug to test its solid-state battery technology on its Hakuto-R lunar lander mission, scheduled for 2021. Capitalism in space: The smallsate rocket company Exos Aerospace has announced that they have scheduled its first fully reusable test flight of its SARGE suborbital rocket for March 2nd. Exos completed the Pathfinder Launch on August 25, 2018 from Spaceport America. It was the first step in validating the SARGE SRLV that was flown and recovered for reuse. Exos gathered critical flight data that enabled advancing the design and setting them up for continued reuse of their SARGE vehicle. ,,,The “Mission 1” test flight of the SARGE reusable system will carry the commercial payloads flown under the programs listed below. A successful launch will further solidify the company’s plan to use this technology as the design basis of their Jaguar orbital launch vehicle with reusable first stage capable of carrying 100kg to Low Earth Orbit (200-400km). The link provides the list of payloads. For their orbital rocket their plan seems straightforward and brilliant. Build a simple suborbital rocket that lands by parachute gently enough so that it can be reused. While using that commercially also use it as the testbed for building an orbital rocket whose first stage would also land by parachute. This approach puts them in direct competition with Blue Origin and Virgin Galactic for the suborbital business, and likely at a much cheaper price than either. And if the plan works to orbit, it also positions them to be a strong competitor in the smallsat orbital rocket business, being the first with a reusable vertically launched rocket. An evening pause: From the great Irving Berlin musical, Annie Get Your Gun (1950). 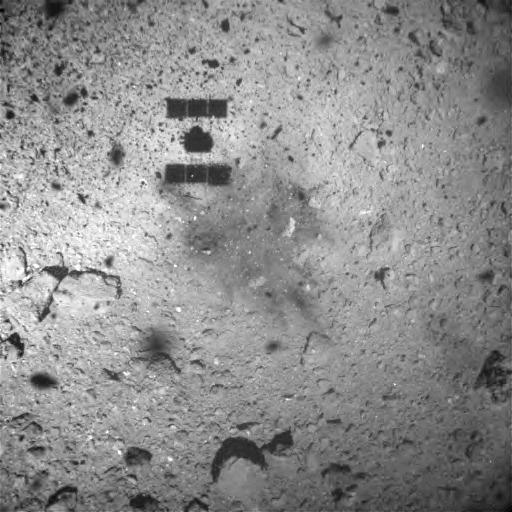 The Hayabusa-2 science team today released images taken during its quick touchdown on the asteroid Ryugu last week. roughly 1 minute after touchdown at an estimated altitude of about 25m (error is a few meter) [80 feet]. The color of the region beneath the spacecraft’s shadow differs from the surroundings and has been discolored by the touchdown. At the moment, the reason for the discoloration is unknown but it may be due to the grit that was blown upwards by the spacecraft thrusters or bullet (projectile). 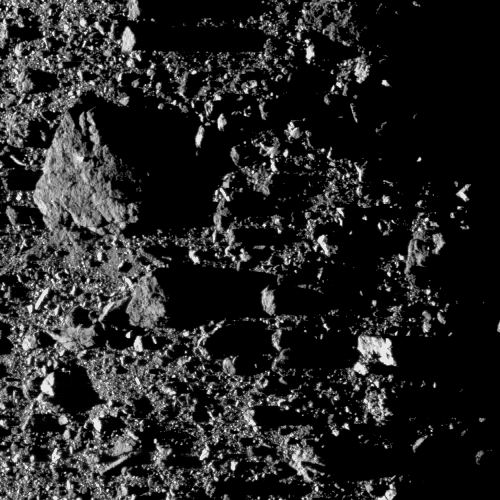 The image proves that everything on Hayabusa-2 worked as planned, and it almost certainly captured some of that grit. They are going to do at least two more touchdowns before they have Hayabusa-2 leave Ryugu and head back to Earth. Embedded below the fold in two parts. Note: Embed of the podcast has been corrected. Capitalism in space: The smallsat rocket company Firefly Aerospace announced yesterday that it will build its rocket manufacturing facility at Cape Canaveral, as well as launch from there. Texas-based launch startup Firefly Aerospace finally revealed its plan to build a manufacturing facility near Kennedy Space Center and outfit the Air Force’s Space Launch Complex 20 in Cape Canaveral for its two core launch vehicles — one of the first manufacturing facilities of its kind in the Sunshine State. Firefly was shrouded under the codename “Maricopa” for months as Space Florida, the state’s space development agency, trickled out details of a deal that includes an 18-acre chunk of Exploration Park and 28 acres at LC20. The value of the deal is $52 million, and Firefly vows to put 200 of its 300 employees in the Cape. Firefly’s first rocket, Alpha, will cost $15 million per launch, which means it will either launch a larger bunch of smallsats or they will be serving the larger smallsats in this new industry. Capitalism in space: The Israeli lunar lander Beresheet, now beginning its circuitous journey to the Moon, has established communications with the Earth while deploying its landing legs. There does appear to be an issue with the spacecraft’s star trackers, but it is not clear how critical this is. Beresheet, by the way, means “In the beginning” in Hebrew. The podcast of my hourlong appearance last night with Steve Thomson on WCCO radio in Minnesota is now available here. An evening pause: On George Washington’s actual birthday, let’s honor our first president with a history lesson essentially written by the man himself, and even more pertinent today. The New Horizons team has released new high resolution images of Ultima Thule, taken during its fly-by on January 1, 2019. These new images of Ultima Thule – obtained by the telephoto Long-Range Reconnaissance Imager (LORRI) just 6½ minutes before New Horizons’ closest approach to the object (officially named 2014 MU69) at 12:33 a.m. EST on Jan. 1 – offer a resolution of about 110 feet (33 meters) per pixel. 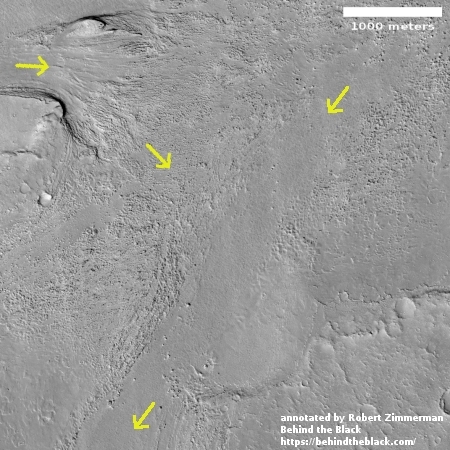 …The higher resolution brings out a many surface features that weren’t readily apparent in earlier images. Among them are several bright, enigmatic, roughly circular patches of terrain. In addition, many small, dark pits near the terminator (the boundary between the sunlit and dark sides of the body) are better resolved. “Whether these features are craters produced by impactors, sublimation pits, collapse pits, or something entirely different, is being debated in our science team,” said John Spencer, deputy project scientist from SwRI. 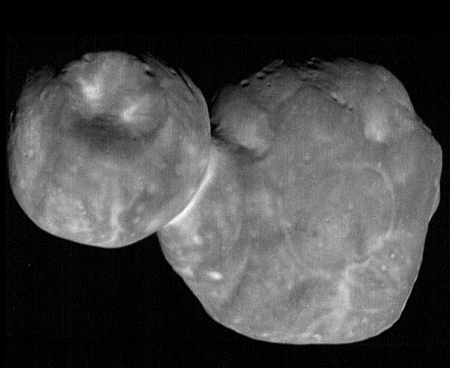 Available at the link above is a three-second long movie they created from these images, showing Ultima Thule as it zips across the camera’s view.